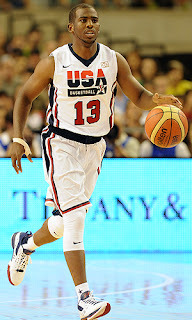 USA Bests Argentina 86-80 ~ Roundball Manor - The House that Basketball Built. The final box score does not tell the full tale of USA's big win over Argentina yesterday. Although the final score makes it appear close, Team USA jumped out to a 16-1 lead, then 19-3, finishing the first quarter 31-16. Kevin Durant led the charge, going 7-11 from behind the arc for 27 points. Kobe played big minutes and finished with 18. 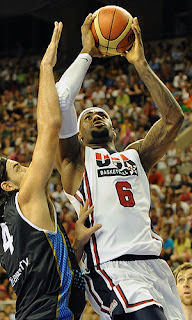 LeBron also had a solid game, posting 15, 7, and 5. Team USA held off several Argentinian runs late in the game, and managed to maintain control, even though the team shot 45% from the field for the game. Their attacking style and transition managed to keep Argentina on their heels playing catch up for the entire game. 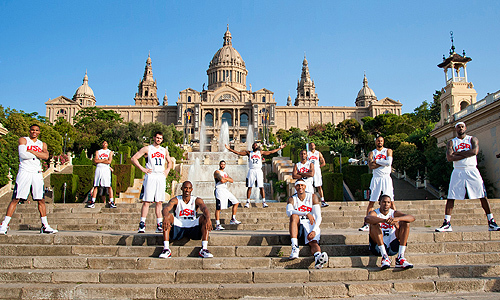 It was the team's best test to date, and they have one more tuneup before the olympics, playing Spain in Barcelona on Tuesday. Since losing his starting spot, Carmelo Anthony has been seen HUSTLING on the court. 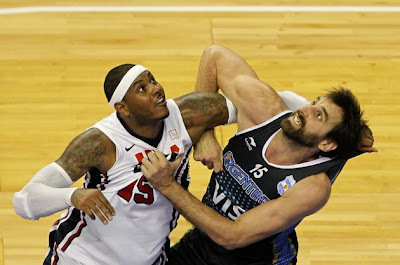 Pictured here fighting for a loose ball with a hairy Argentinian.